Response envelope: A2 size. Brite white opaque envelope. Response card: Brite white cardstock. DISCONTINUED**** Fun and Sassy Invitation: Casual and affordable but bright orange with the surprise of a real Daffodil. 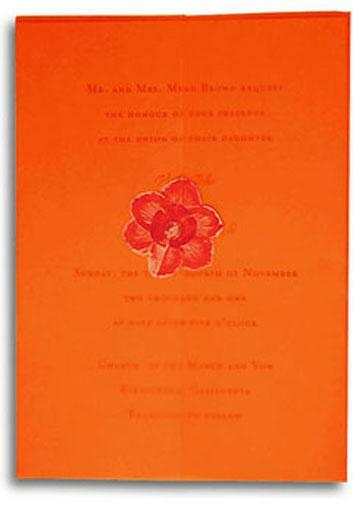 DIY gatefold invitation with a bright orange vellum wrapper -- closes with a real pressed red and orange daffodil flower. A modern, colorful, and economical invitation. Wrapper of translucent orange vellum. Closes with a real pressed flower - a vivid orange and red daffodil. Invitation Card: Britewhite recycled cardstock. Outer envelope: Britewhite opaque envelope.